High and Low Dose of L-Arginine Equally Ineffective in Promoting Nitric Oxide Synthesis in Young Active Men at Rest - GH and IGF-1 Response Negligible. "No NO from l-arginine", you probably remember this or similar headlines from a few years ago, when the first studies seemed to indicate that l-arginine, the main "working" ingredient in all the (over-)hyped nitric oxide (NO) boosters that had become an integral part of the line-up of each and every major supplement producer was found not to increase the amount of nitric oxide in their consumers' bloodstream. Although these results stand in stark contrast to the early studies using intravenous infusion of l-arginine, which established the myth of the NO and growth hormone boosting effects of 2-amino-5-guanidinovaleric acid (l-arginine), a 2007 study by Malinauskas et al. (Malinauskas. 2007) found that 8% of the male student athletes who participated in their survey were still interested in the ingestion of l-arginine containing supplements. 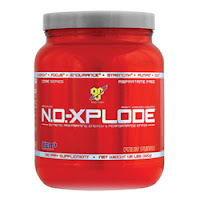 Thus, it does not come as a surprise that - even with the rise of the so-called 2nd generation pre-workout products - the classic, l-arginine based products such as NO XPlode, SuperPump and Co. still have a huge fanbase, the majority of whose members, asked about why they are taking the respective product, will certainly answer "for the pump". plasma concentrations significantly increased (p < 0.05) to a similar level [+178% and +204%] above resting values, respectively)at all time points in both the low- and high-dose conditions, while there was no change in the placebo condition over time. Or, in other words, there was a tight regulation of maximal l-arginine levels in the plasma of the subjects, either via decreased absorption or increased metabolism of the orally ingested l-arginine (it is estimated that with increasing doses >40% of the ingested arginine is degraded by the small intestine). all that, despite the fact that the area under the curve (iAUC), a measure for the total amount of l-arginine that was taken up and metabolized by the subjects, did in fact reveal "a significant difference between the L-arginine conditions and placebo and between the high and low relative doses." With regard to the nitric oxide production, this dose dependent increase in plasma arginine levels turned out to be useless, or in fact counterproductive, as contrary to expectation the area under the curve (iAUC) "for NOx with the high relative dose was significantly lower than that for the low dose of L-arginine" - a clear sign that "overuse" of large amounts l-arginine could diminishes the already negligible on nitric oxide production at rest. Before totally discarding arginine, however, I suggest you tune in to tomorrow's episode of Super Human Radio. In the 2nd installment of the "Amino Acids for Super Humans" series, I will provide further insights into what we really know about arginine and its "metabolic children" ornithine and citrulline and how they may effect how you look, feel and perform in and outside the gym.